On the evening of October 11th, 1973, nineteen-year-old Calvin Parker and forty-two-year-old Charles Hickson were fishing on Pascagoula river, Mississippi, USA. before experiencing something that would change their lives forever. They preferred to go fishing at night as the fish are said to be easier to catch. But, when they heard a strange buzzing near them, they turned around to see a strange egg-shaped object floating a few feet above the water. They reported that the object had a “blueish lighting”, and despite being out on their own, with no one else around, the object managed to get within 10 feet of them without them being aware of it (until of course they heard the buzzing and noticed it). As they froze to the spot and gazed at the UFO, they reported that a frontal door opened and they saw three beings. In the report, they say the beings were of “unknown origin coming straight to them” and described them as being; about 5ft tall, with bullet shaped heads, no necks, small slits for mouths, and their noses and ears were thin cone like objects protruding out, described like the carrots you would put on a snowman. This is where the stories seems to have a discrepancy… One story is that both men were awake, but another states that Parker (age 19) fainted. Whichever is true, Hickson was awake during the events that followed. The beings were reported to have legs, but when approaching the two men from their UFO, they didn’t use them, instead, they floated (or hovered forward) over the water. When the beings approached and touched them, Hickson, still frozen in fear, said he felt a numbness come over his entire body, ultimately leading to what he believed (in our understanding) to be temporary paralysis. This is where there is another discrepancy… One story is that the two men were picked up by the beings and taken to the craft, while another shares Hickson’s description of the event was that he was held and somehow floated across the water with the guidance of the beings. It’s a small discrepancy, but either way, the two men ended up on the craft. Once inside, the two men were separated, and the only further account is from that of Hickson as Parker had fainted and was still said to be unconscious. Hickson recalls being led to a brightly lit room, and still floating, he was never put on the ground during his time in the UFO. He was levitating while what he describes as an “eye-like object” hovered over his body, thought to be conducting a test, in his words “scanning” him. He said this “scan” lasted 20 minutes, after which time, the beings led him out the room, and he, still under the guidance of the beings, floated back to the river banks where he was reunited with Parker. Parker was now conscious and was crying and praying, clearly aware of what was happening. The beings then put Hickson on the ground, returned to their egg-shaped object (UFO) and the doors closed. The object took off, and was never seen by the two men again. 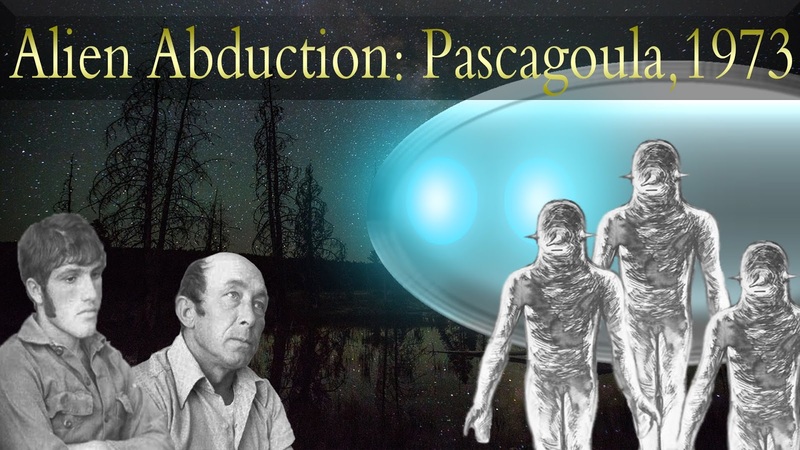 Immediately after the event, they wanted to tell the public about their Pascagoula alien abduction story, in an attempt to alert people… and prevent others from going through the same ordeal? It is said they wanted to be careful about how they shared their story, so they contacted their local Air Force base, Keeslar. The Air Force told them they needed to report it to their local sheriff’s office, but Parker and Hickson knew the sheriff’s office would dismiss it as a joke or a hoax. Deciding to go with the newspaper, they attempted to contact them, but by now, it was very late and the newspaper office was shut, so they begrudgingly went to the sheriff’s office to explain the events of that evening. Right away, officers thought it was a hoax. They put the men in an interview room, and unknowingly to the two abductees, the room was wired and the sheriff’s could hear their entire conversation. Expecting to hear them plotting what to say, maybe laughing about fooling everyone with their story, the Sheriffs actually heard something far different; the two men were talking about the events from that evening and were both still in complete fear. Deciding the two may be telling the truth, the Sheriffs heard them out and the case was documented. The story got out and spread like wild fire, getting the attention of many researchers. It is said that someone tried to hypnotize Hickson, but going back to such a frightened state, the hypnosis was stopped. Hickson also took it upon himself to undergo a polygraph test. There is much skepticism surrounding this element of the story though. Hickson apparently used a very inexperienced tester to conduct the polygraph (maybe unknowingly), and when requested to do another polygraph with a professional police tester, Hickson refused. He did pass the original polygraph test, but there is not a clear reason why he refused the police test, which has led many to believe it was a hoax. The 1973 Pascagoula Alien Abduction case had a lot of time and research dedicated to it, but with no evidence of the events, and Hickson and Parker being the only two witnesses, it’s not considered very credible for researchers as, say, the Rendlesham Forest incident, for example. Furthermore, Parker was said to once report events from inside the UFO, despite previously saying he was unconscious throughout the ordeal. Do you think the two came up with the idea to spread a story of being abducted by extra-terrestrials or do you think the Pascagoula Alien Abduction was an event that unfolded just how they said, and the discrepancies came from confusion, fear, and inaccurate recollections of their memories? Let us know your thoughts in the comments below.